The Euro Bus Tour dates are July 5 through August 19, 2019. The tentative schedule is posted below. At this time we want to hear from anyone who is interested in coming on the tour, even if you think that you may not be able to afford it. (Sometimes we can find sponsors to help pay for a portion of your tour fees.) We are still figuring out the costs, which will be somewhere between €1100 and €1500 not including airfare, depending on how many donations we receive to help subsidize the tour and make it more affordable. 19 FRI – Travel day. Camp near Barcelona. 21 SUN – 25 THU, Barcelona or Malaga as base camp from which we’ll take day trips to explore that region of Spain. Details to be determined. 26 FRI – New Vraja Mandala, Spain, Holy Name Kirtan festival and 40th Anniversary celebration. 10 SAT – Switzerland – Scenic adventure to the top of “First” mountain (via gondola), easy hike to Bachalpsee (lake), and riding mountain gocarts on the way down. Optional adventure activities: Paragliding or Ziplining (down the mountain). Other upcoming ISKCON youth events, and youth-friendly events, around the world. Euro Bus Tour 2019 – July 5-August 19, 2019. See above. Polish Festival Tour, Festiwal Indii, approximately June 20 – August 25 (exact dates to be determined.) Pol’and’Rock, formerly Woodstock festival, will be held July 31 – August 3. The devotees will set up the Krishna Village of Peace and start with kirtan and prasad distribution two days earlier, July 29. Holy Name Festival & 40th Anniversary of New Vraja Mandala, Spain, August 26-28. Big kirtan festival. The Euro Bus Tour will be there. 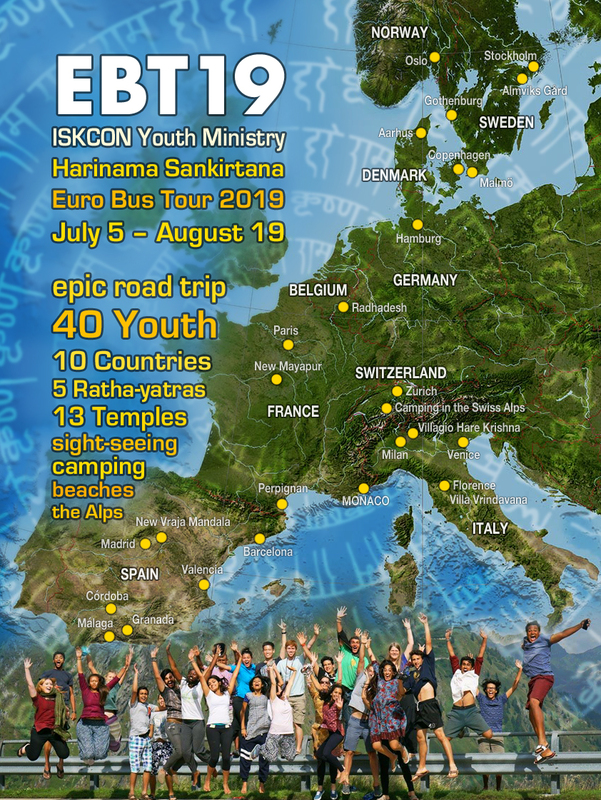 Youth Summer Camp at New Mayapur, France, for youth ages 14 and up, August 8-14. Lord Balarama’s Appearance Day festival will be celebrated in New Mayapur (large Krishna Balarama deities) with two days of kirtana August 14-15. This year is also the 40th anniversary of the installation of Sri Sri Radha Govinda-Madhava, NM’s large Radha-Krishna deities. Festival of India tour for young men, all over North America, May-September. Dominican Republic tour, mid December 2019 through early January 2020. Instead of traveling to Mexico, our North American youth, along with other youth from around the world, will be flying to the Dominican Republic in December to help with two Ratha-yatra festivals, several Harinamas, and go on lots of adventures around this tropical Caribbean island. Krishna Balaram Youth Retreat, late June (dates to be determined). Radha Krishna Camp for Teens ages 12-16, Nova Gokula Dhama, Brazil, second week of January, 2020. Dates to be determined. Read the ISKCON News article about a previous year’s camp. Contact us for more information on any of the above. 25th Anniversary Bus Tour, June, July, August 2020. Two and a half months epic bus tour following the Ratha-yatra Festival of India across the USA and Canada, visiting dozens of temples and all the best scenic stops, national parks, and adventure activities along the way. 50 youth, two buses, the best of the best of 25 years of bus tours packed into one iconic road trip.